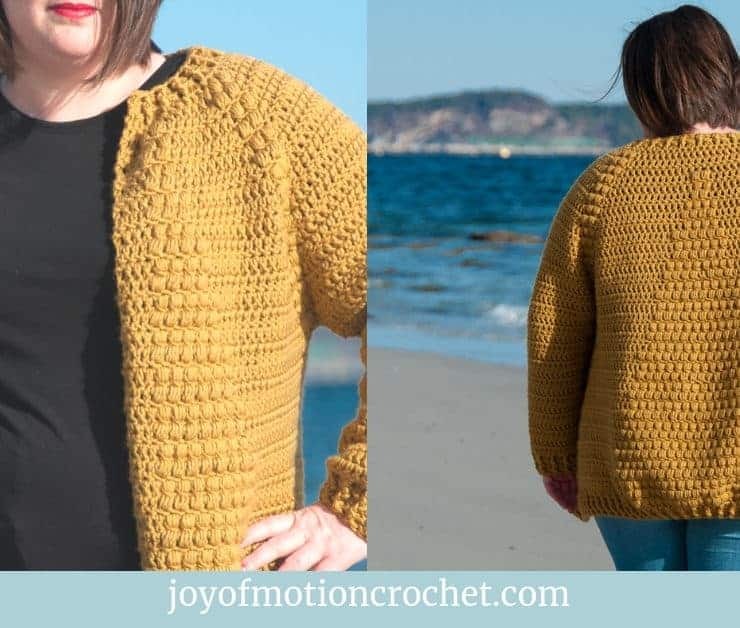 You’re going to love the crochet Polus Cardigan, because it’s such a great crochet piece to add to your wardrobe. 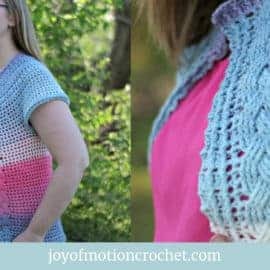 This free crochet cardigan pattern is also a great crochet top down cardigan with lace details. 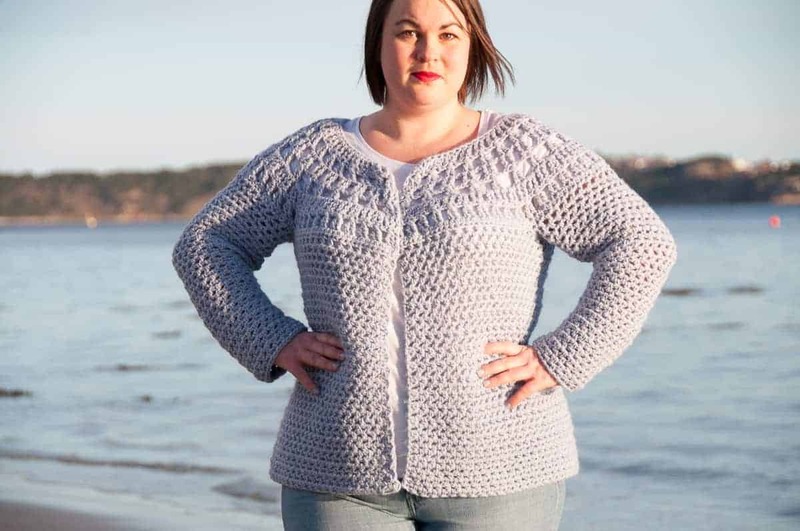 What’s also great about this cardigan is the shaped waist. 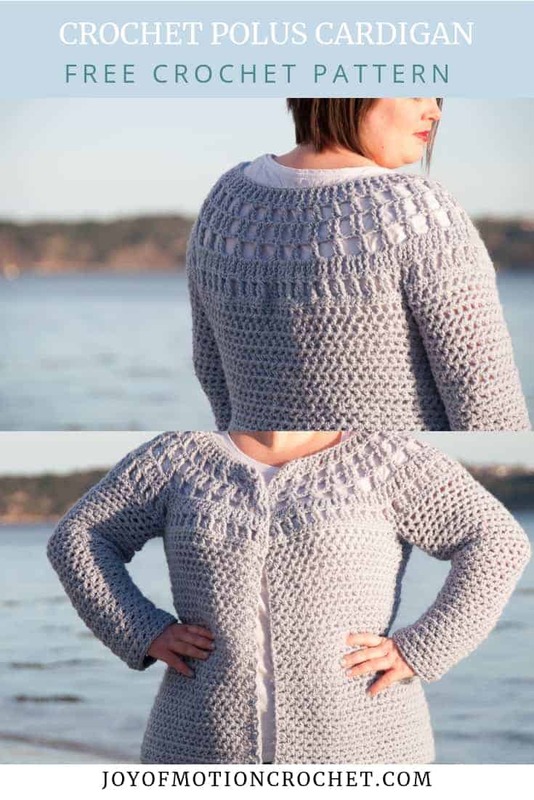 Next, it is also an amazing cardigan for fall & winter, because it is so warm & nice to wear in cold weather. 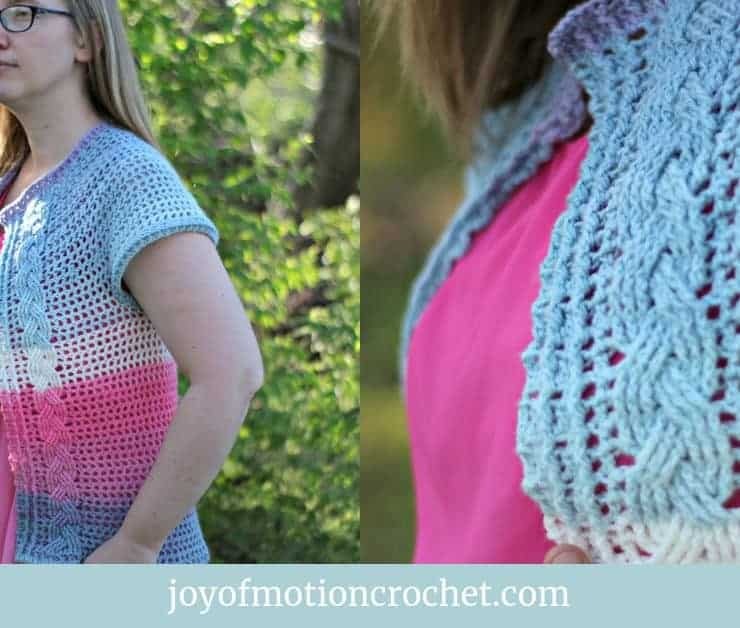 At the same time, if made in cotton or any summer yarn, it’s such a great pattern for spring & summer. 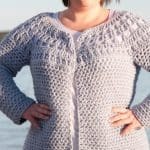 For this crochet garment you’ll need some warm yarn. 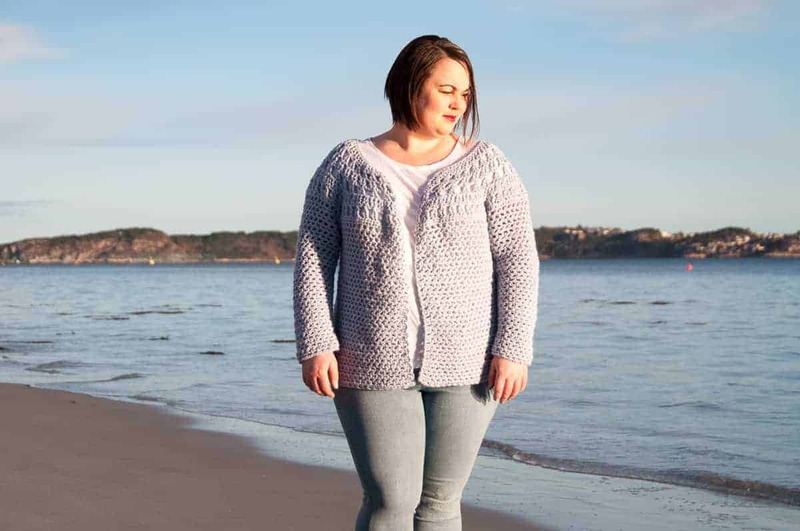 The crochet Polus Cardigan was designed using Alpaca Blend from Patons. 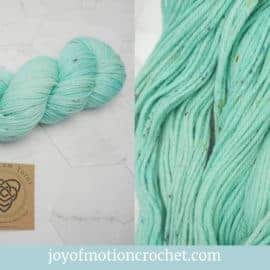 You can find the Alpaca Blend yarn here. 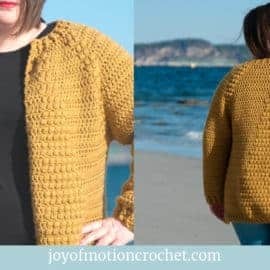 Have you ever wanted to try crocheting a cardigan with a round yoke from the top down? 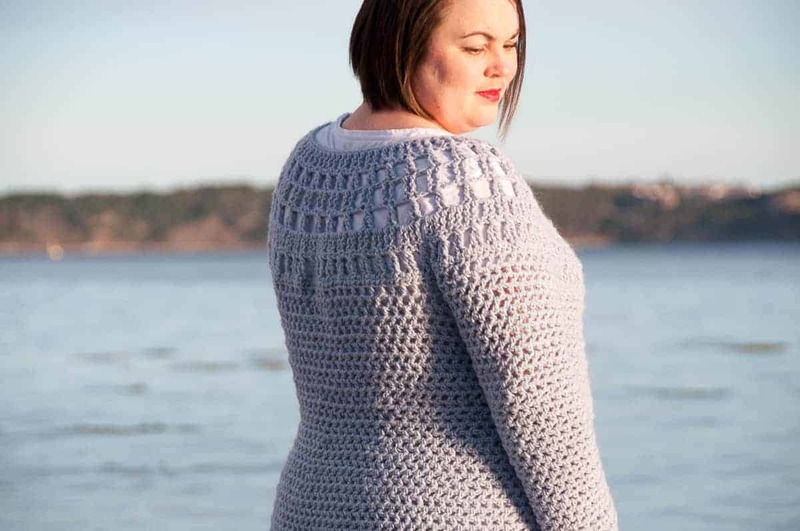 Well, this is the perfect first cardigan for just that. 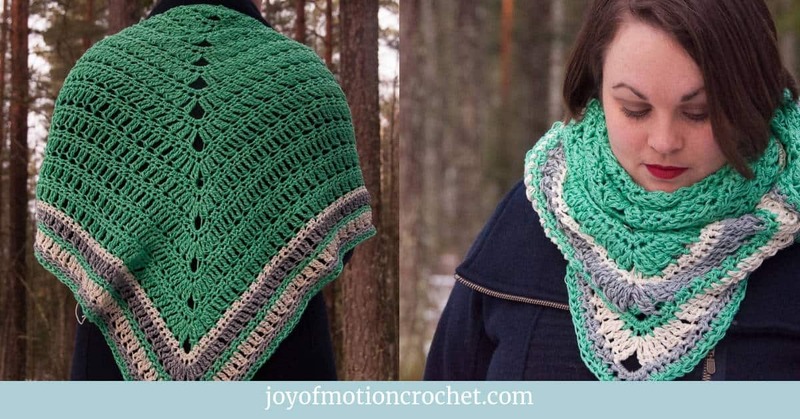 First of all it works up really fast, because you’re using rather thick yarn. At the same time it’s light to wear & looks beautiful. 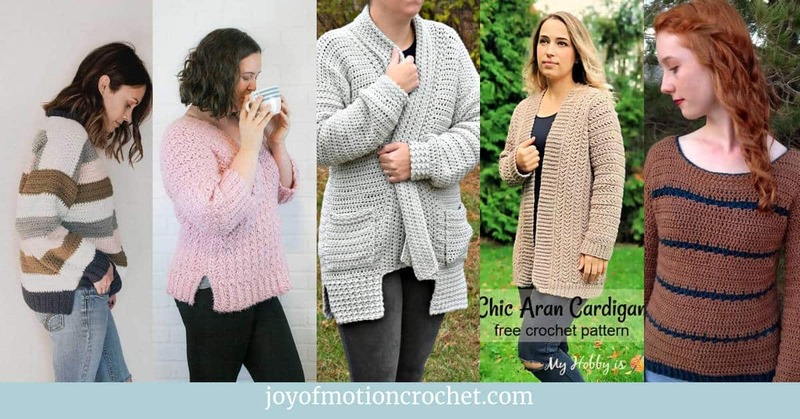 Since you like the crochet Polus Cardigan, these might interest you too? 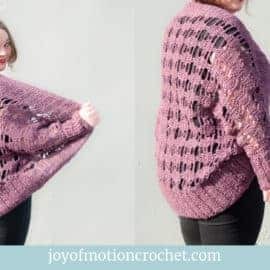 The crochet Polus Cardigan is a great crochet garment for your wardrobe, & let’s fill it with lots of crocheted clothes. 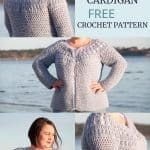 This crochet pattern is crocheted from the top down, with a round yoke & it has a shaped waist. 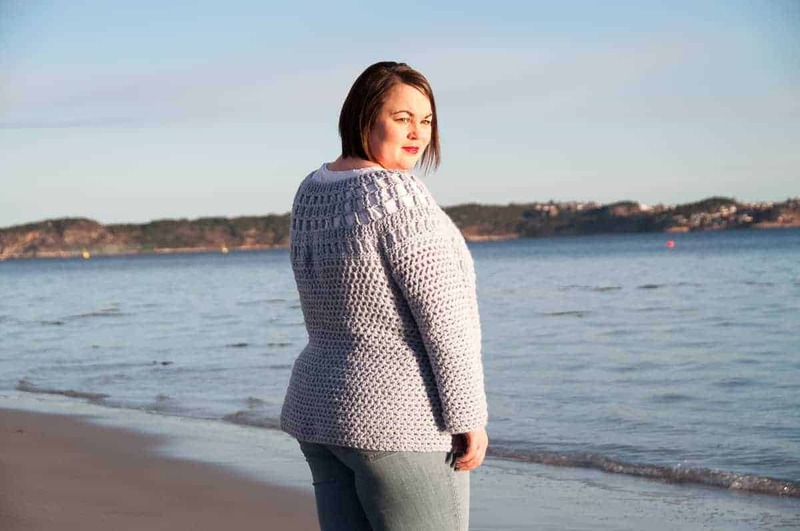 The crochet Polus Cardigan comes in 9 sizes from XS – 5XL & there’s also suggestions on how you can adjust it to fit you perfectly! 13 stitches & 9 rows per 10 cm / 4”. At the end of each row, the stitch count is given in parenthesis. If -, it means you won’t work that row with those instructions & the instructions for your size is given another place. 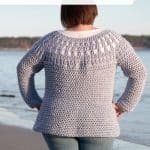 This pattern is written to have a standard/ normal fit. 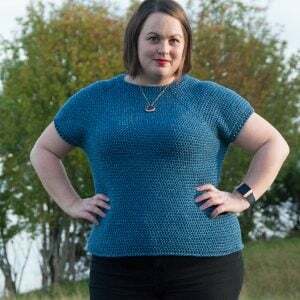 For all sizes: Best places to adjust length by adding or reducing rounds are: After round 13 before decreasing for waist, after round 19 before increasing after waist, alternatively at the end. 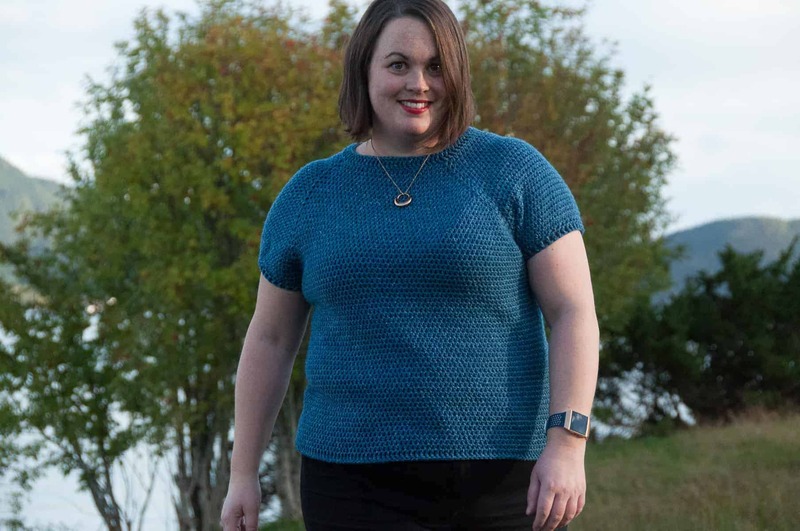 For all sizes: Best places to adjust length by adding or reducing rows are at the end. Alternatively evenly throughout between decreases. 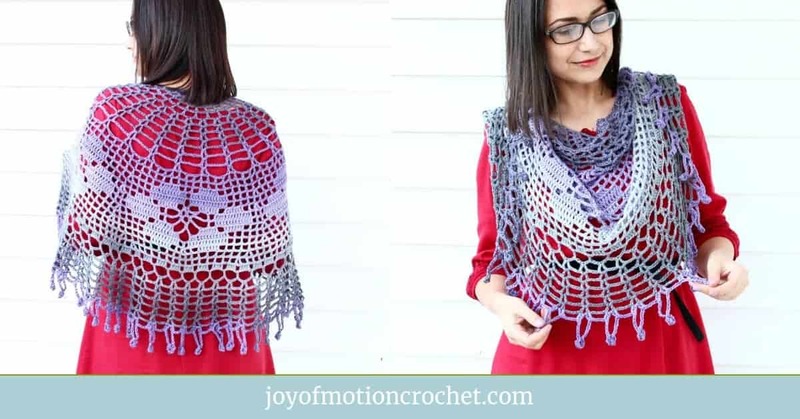 You will need to use the chain, half double crochet, & the foundation single crochet. 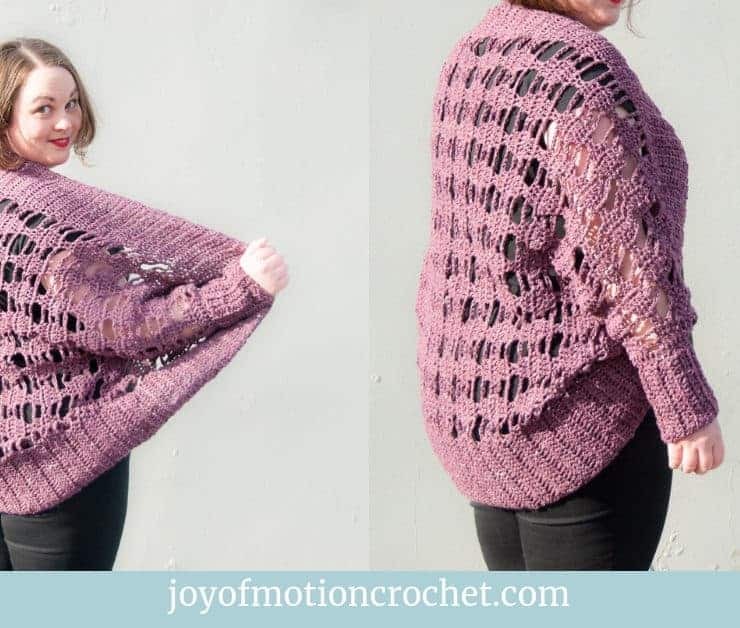 Yarn over, pull up a loop from the next(first) ch-space, pull up a loop from the next(second) ch-space, yarn over, pull through all loops on hook. Hdc 1 in next ch-space, ch 1, hdc 1 in same ch space, ch 1. Make 72 st using the FSC technique. Row 1: Ch 3 st (counts as 1st st), *tr 1 in the next 2 st, ch 1, do not sk st*, repeat from *to* until you have 3 st left, tr 1 in the last 3 st, turn (=106 st). Row 2: Ch 3 st (counts as 1st st), *sk 1 st, tr 1 in the next st, tr 1 in sk st, ch 1, sk st for 1st tr & next st*, repeat from *to* until you have 3 st left, sk 1 st, tr 1 in the next st, tr 1 in sk st, sk st for 1st tr, tr 1 in the last st, turn (=106 st). Row 3: Ch 3 st (counts as 1st st), *tr 1 in the next 2 st, ch 2 & sk 1 st*, repeat from *to* until you have 3 st left, tr 1 in the last 3 st, turn (=140 st). Row 4: Ch 3 st (counts as 1st st), *sk 1 st, tr 1 in the next st, tr 1 in prev st, ch 2, sk st for 1st tr & next 2 st*, repeat from *to* until you have 3 st left, sk 1 st, tr 1 in the next st, tr 1 in sk st, sk st for 1st tr, tr 1 in the last st, turn (=140 st). Row 5: Ch 3 st (counts as 1st st), *tr 1 in the next 2 st, ch 1, do not sk st, tr 2 in ch-space, ch 1, do not sk st*, repeat from *to* until you have 3 st left, tr 1 in last 3 st, turn (=208). Row 6: Repeat row 2 (=208). Row 5: Repeat row 1 (=310). Row 6: Repeat row 2 (=310). Do not fasten thread, continue with same thread on body. 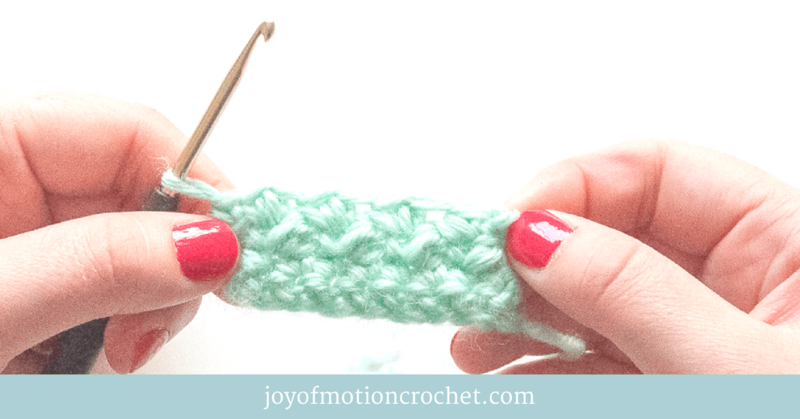 Grab 4 stitch markers to mark off where the arms & body go. Starting where you left off on the yoke. Count 20 (22) 23 (32) 32 (32) 46 (46) 46 stitches and place a stitch marker in that stitch. Count another 32 (28) 26 (42) 42 (42) 65 (65) 65 stitches and place a stitch maker in that stitch. 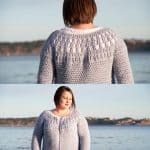 Count another 38 (42) 44 (62) 62 (62) 90 (90) 90 stitches and place a stitch marker in that stitch. Count another 32 (28) 26 (42) 42 (42) 65 (65) 65 stitches and place a stitch marker in that stitch. 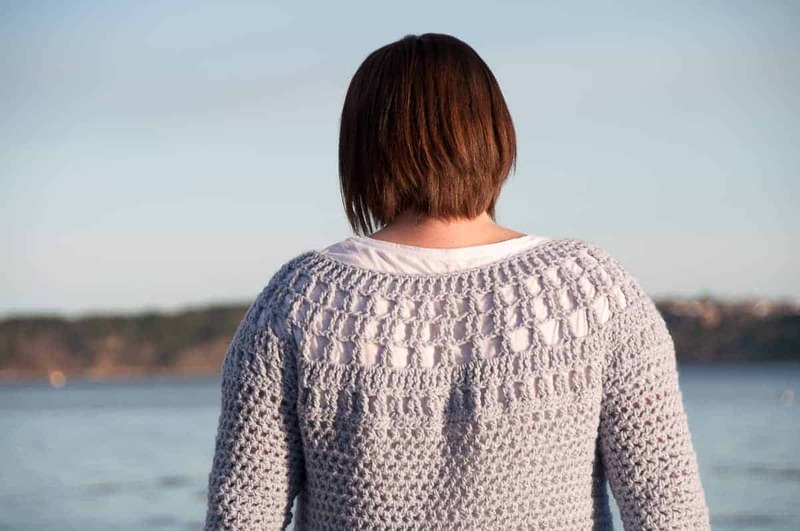 *Marked stitches will become either a part of the front panels or the back. Row 1: Hdc directly in 1st st, hdc 1 in the next 19 (21) 22 (31) 31 (31) 45 (45) 45 st, make 12 (17) 20 (9) 14 (20) 2 (7) 10 st using the FSC technique, place stitch marker in wrong side of FSC number 6 (9) 5 (5) 7 (5) 1 (4) 5, sk the next 31 (27) 25 (41) 41 (41) 64 (64) 64 st, hdc 1 in the next 38 (42) 44 (62) 62 (62) 90 (90) 90 st, make 12 (17) 20 (9) 14 (20) 2 (7) 10 st using the FSC technique, place stitch marker in wrong side of FSC number 6 (9) 5 (5) 7 (5) 1 (4) 5, sk the next 31 (27) 25 (41) 41 (41) 64 (64) 64 st, hdc 1 in the next 20 (22) 23 (32) 32 (32) 46 (46) 46 st, turn (= 102 (120) 130 (144) 154 (166) 186 (196) 202 st). 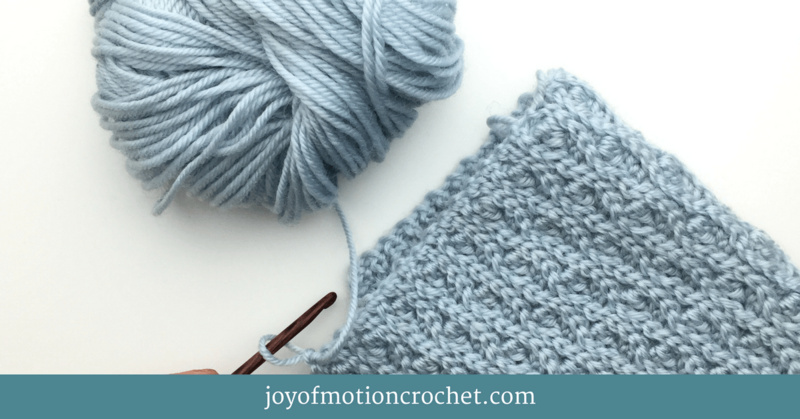 *Stitch markers placed on this row is needed when you make the arms. Row 2: Hdc directly in 1st st (no ch), *hdc 1 in the next st, ch 1 & sk 1 st*, repeat from *to* until you have 1 st left, hdc 1 in last st, turn (= 102 (120) 130 (144) 154 (166) 186 (196) 202 st). Row 3: Hdc directly in 1st st (no ch), *hdc 1 in the next ch-space, ch 1 & sk 1 st*, repeat from *to* until you have 1 st left, hdc 1 in last st, turn (= 102 (120) 130 (144) 154 (166) 186 (196) 202 st). Row 4-13: Repeat row 3. Row 14: Hdc directly in 1st st, *hdc 1 in the next ch-space, ch 1 & sk 1 st*, repeat from *to* 4 times, hdc dec in ch-space, ch 1 & sk 1 st, [*hdc 1 in the next ch-space, ch 1 & sk 1 st*, repeat from *to* st 3 (4) 5 (6) 6 (7) (8) 8 (9) times, hdc dec in ch-space, ch 1 & sk 1 st], repeat from [ to ] 8 times, *hdc 1 in the next ch-space, ch 1 & sk 1 st* repeat from *to* until you have 1 st left, hdc 1 in last st, turn (= 84 (102) 112 (126) 136 (148) 168 (178) 184 st). Row 15-18: Repeat row 3, (= 84 (102) 112 (126) 136 (148) 168 (178) 184 st). Row 19: Hdc directly in 1st st, *hdc 1 in the next ch-space, ch 1 & sk 1 st*, repeat from *to* 4 times, hdc inc in ch-space, [*hdc 1 in the next ch-space, ch 1 & sk 1 st*, repeat from *to* st 3 (4) 5 (6) 6 (7) (8) 8 (9) times, hdc inc in ch-space], repeat from [ to ] 8 times, *hdc 1 in the next ch-space, ch 1 & sk 1 st* repeat from *to* until you have 1 st left, hdc 1 in last st, turn (= 102 (120) 130 (144) 154 (166) 186 (196) 202 st). Row 20-23: Repeat row 3, (= 102 (120) 130 (144) 154 (166) 186 (196) 202 st). Row 24: Hdc directly in 1st st, *hdc 1 in the next ch-space, ch 1 & sk 1 st*, repeat from *to* 4 times, hdc inc in ch-space, [*hdc 1 in the next ch-space, ch 1 & sk 1 st*, repeat from *to* st 4 (5) 6 (7) 7 (8) (9) 9 (10) times, hdc inc in ch-space], repeat from [ to ] 8 times, *hdc 1 in the next ch-space, ch 1 & sk 1 st* repeat from *to* until you have 1 st left, hdc 1 in last st, turn (= 120 (138) 148 (162) 172 (184) 204 (214) 220 st). Row 25-39: Repeat row 3, (= 120 (138) 148 (162) 172 (184) 204 (214) 220 st). 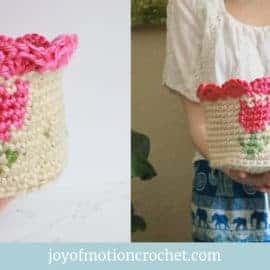 Cut yarn & fasten thread. Attach thread in the middle under the arm, where you made FSC st on the body, in marked stitch. Row 1: Hdc 1 directly in the st you attached the thread, hdc 1 in the next 5 (8) 9 (4) 6 (9) 0 (3) 4 st (FSC st), hdc 1 in the next 31 (27) 25 (41) 41 (41) 64 (64) 64 along the yoke, hdc 1 in the last 5 (8) 9 (4) 6 (9) 1 (2) 5 st (FSC st), if you have 1 st left, see notes for your size, turn (= 42 (44) 46 (50) 56 (62) 66 (72) 74 st). XS: Leave last st unworked. 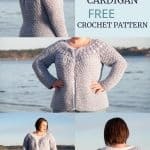 M, XL, 2XL & 4XL: Crochet 2 hdc in last st.
Row 2: Hdc directly in 1st st (no ch), *hdc 1 in the next st, ch 1 & sk 1 st*, repeat from *to* until you have 1 st left, hdc 1 in last st, turn (= 42 (44) 46 (50) 56 (62) 66 (72) 74 st). Row 3: Hdc directly in 1st st (no ch), *hdc 1 in ch space, ch 1 & sk 1 st*, repeat from *to* until you have 1 st left, hdc 1 in last st, turn (= 42 (44) 46 (50) 56 (62) 66 (72) 74 st). Row 5: Hdc 1 directly in 1st st (no ch), hdc dec in ch-space, ch 1 & sk 1 st, *hdc 1 in ch space, ch 1 & sk 1 st*, repeat from *to* until you have 6 st left, hdc dec in ch-space, ch 1 & sk 1 st, hdc 1 in last st, turn (= 38 (40) 42 (46) 52 (58) 62 (68) 70 st). Row 6-8: Repeat row 3, (= 38 (40) 42 (46) 52 (58) 62 (68) 70 st). Row 9: Hdc 1 directly in 1st st (no ch), hdc dec in ch-space, ch 1 & sk 1 st, *hdc 1 in ch space, ch 1 & sk 1 st*, repeat from *to* until you have 6 st left, hdc dec in ch-space, ch 1 & sk 1 st, hdc 1 in last st, turn (= 34 (36) 38 (42) 48 (54) 58 (64) 66 st). Row 10-12: Repeat row 3, (= 34 (36) 38 (42) 48 (54) 58 (64) 66 st). Row 13: Hdc 1 directly in 1st st (no ch), hdc dec in ch-space, ch 1 & sk 1 st, *hdc 1 in ch space, ch 1 & sk 1 st*, repeat from *to* until you have 6 st left, hdc dec in ch-space, ch 1 & sk 1 st, hdc 1 in last st, turn (= 30 (32) 34 (38) 44 (50) 54 (60) 62 st). Row 14-16: Repeat row 3, 30 (32) 34 (38) 44 (50) 54 (60) 62 st). Row 17-39: Repeat row 3, (= 30 (32) 34 (-) – (-) – (-) – st). Row 17: Hdc 1 directly in 1st st (no ch), hdc dec in ch-space, ch 1 & sk 1 st, *hdc 1 in ch space, ch 1 & sk 1 st*, repeat from *to* until you have 6 st left, hdc dec in ch-space, ch 1 & sk 1 st, hdc 1 in last st, turn (= – (-) – (34) 40 (46) 50 (56) 58 st). Row 18-20: Repeat row 3 (= – (-) – (34) 40 (46) 50 (56) 58 st). Row 21-39: Repeat row 22. Row 21: Hdc 1 directly in 1st st (no ch), hdc dec in ch-space, ch 1 & sk 1 st, *hdc 1 in ch space, ch 1 & sk 1 st*, repeat from *to* until you have 6 st left, hdc dec in ch-space, ch 1 & sk 1 st, hdc 1 in last st, turn (= – (-) – (-) 36 (42) 46 (52) 54 st). Row 22-24: Repeat row 3, (= – (-) – (-) 36 (42) 46 (52) 54 st). Row 25-39: Repeat row 3, (= – (-) – (-) 36 (-) – (-) – st). Row 25: Hdc 1 directly in 1st st (no ch), hdc dec in ch-space, ch 1 & sk 1 st, *hdc 1 in ch space, ch 1 & sk 1 st*, repeat from *to* until you have 6 st left, hdc dec in ch-space, ch 1 & sk 1 st, hdc 1 in last st, turn (= – (-) – (-) – (38) 42 (48) 50 st). Row 26-28: Repeat row 3, (= – (-) – (-) – (38) 42 (48) 50 st). Row 29-39: Repeat row 3, (= – (-) – (-) – (38) – (-) – st). Row 29: Hdc 1 directly in 1st st (no ch), hdc dec in ch-space, ch 1 & sk 1 st, *hdc 1 in ch space, ch 1 & sk 1 st*, repeat from *to* until you have 6 st left, hdc dec in ch-space, ch 1 & sk 1 st, hdc 1 in last st, turn (= – (-) – (-) – (-) 38 (44) 46 st). Row 34-36: Repeat row 3, (= – (-) – (-) – (-) 38 (44) 46 st). Row 37-39: Repeat row 3, (= – (-) – (-) – (-) 38 (-) – st). Row 37: Hdc 1 directly in 1st st (no ch), hdc dec in ch-space, ch 1 & sk 1 st, *hdc 1 in ch space, ch 1 & sk 1 st*, repeat from *to* until you have 6 st left, hdc dec in ch-space, ch 1 & sk 1 st, hdc 1 in last st, turn (= – (-) – (-) – (-) – (40) 42 st). Row 38-39: Repeat row 3, (= – (-) – (-) – (-) – (40) 42 st). 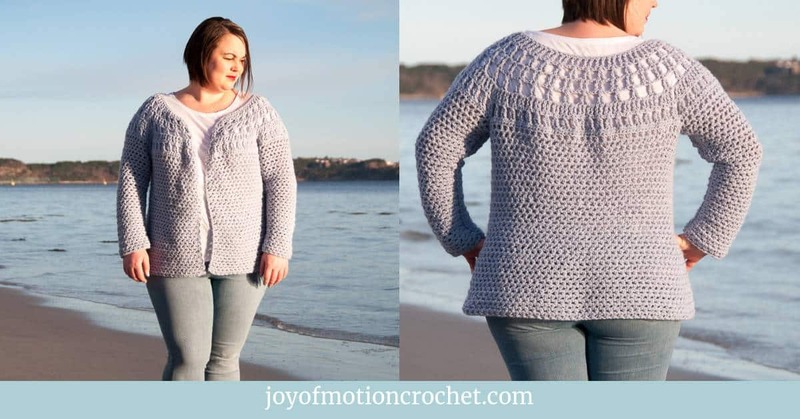 I really hope you liked the crochet Polus Cardigan! However, if you really like it, make sure to share the FREE pattern & share pictures of your crochet Polus Cardigan that you’ve made with me. 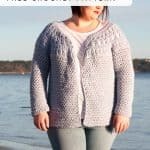 Share your finished crochet Polus Cardigan on Love Crochet. 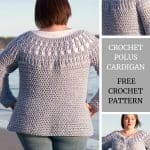 Share your finished crochet Polus Cardigan on Ravelry. 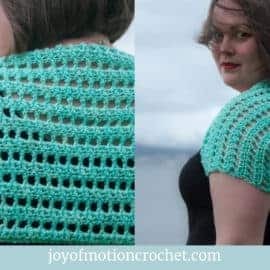 I love this sweater pattern. I made one for my daughter and she loves it. 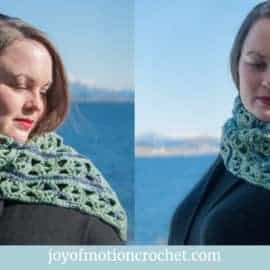 It works up so fast using bulky yarn. It is awesome. Thanks so much for such gorgeous patterns. Thank you! Yours turned out so amazing! Love how it looks in yellow! I love this sweater. It’s gorgeous. 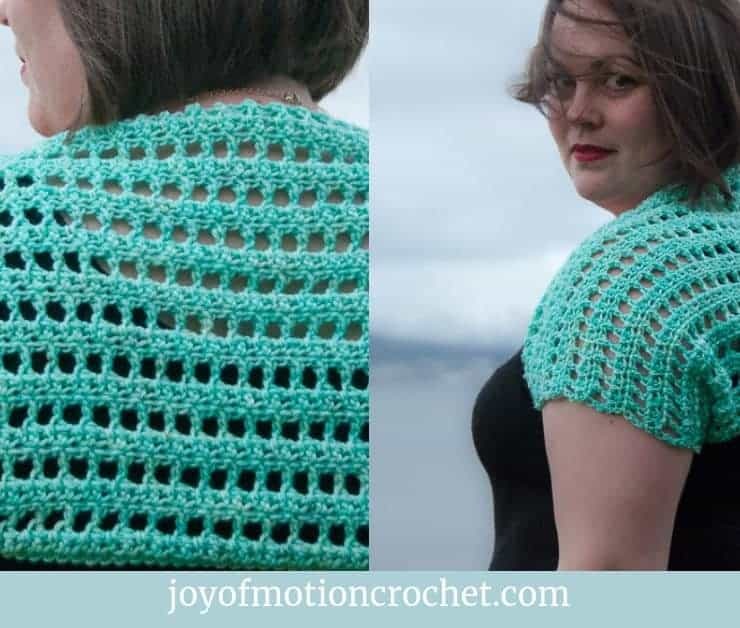 This looks fab, simple but not too simple! 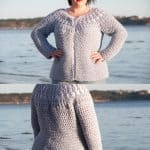 Pinning – thanks for the pattern. Thank you so much, I’m glad you like it! Thanks for pinning! 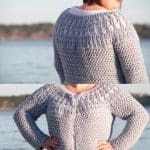 Hsllo, I would like to make a spring cardigan usi d a thinner yarn for hook nb. 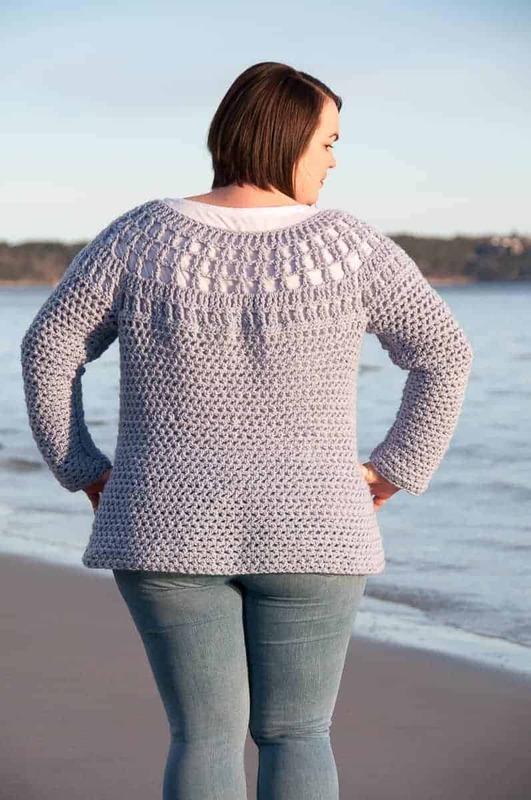 4, how can I adjust the pattern? Depending on the size you want to make. 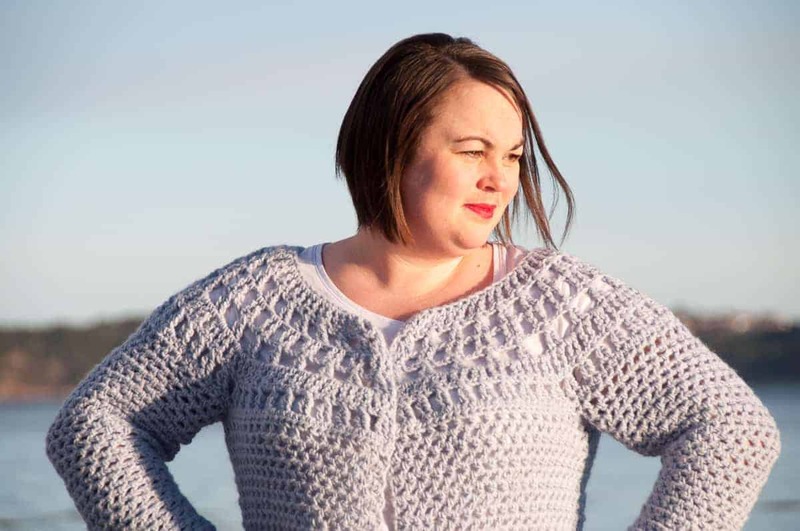 If there is sizes listed bigger than the one you want to make, I would just go up a size or two. 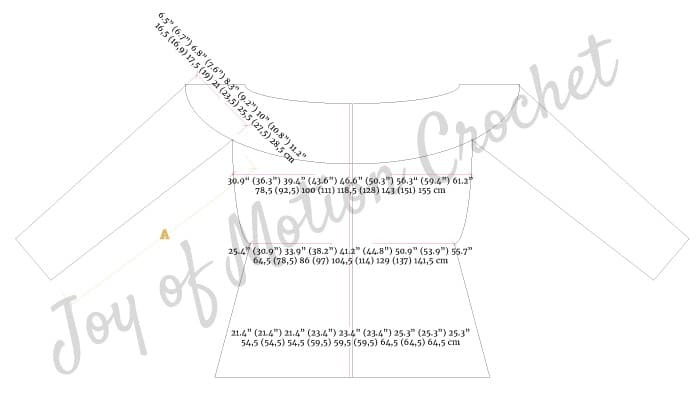 I would also check the gauge & see how many stitches I would need to achieve your measurements. If you measure yourself, you know how wide the garment needs to be. Next, check with the help of the gauge how many stitches your measurement would be equal. 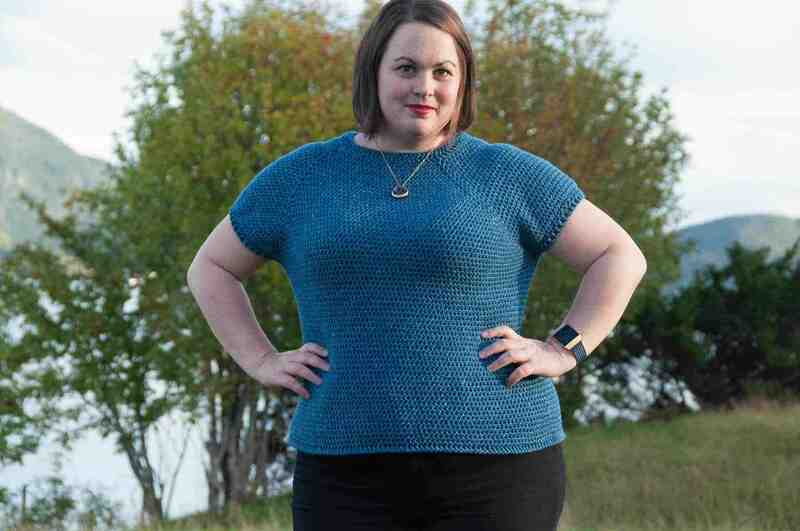 Janne, I love your designs, but my old body is not one for shaped waists.